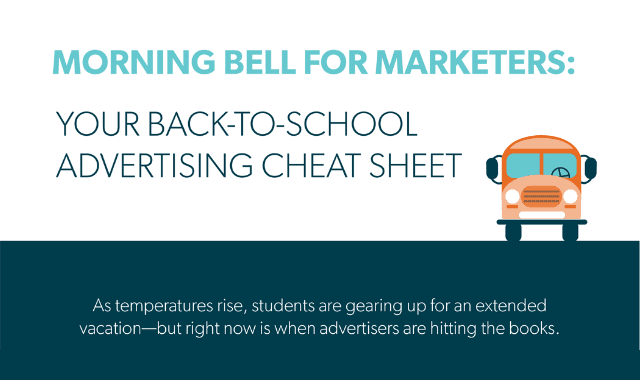 Morning Bell for Marketers: Your Back-to-School Advertising Cheat Sheet #Infographic ~ Visualistan '+g+"
With back to school budgets on the rise, retailers face an optimistic outlook heading into the summer months. Class might be dismissed for the summer, but now is the time for advertisers to hit the books and craft a strategic digital advertising strategy informed by the complex seasonality nuances of back-to-school season. The big trends to watch this year: Back to school shoppers are spending more, shopping earlier and doing their homework (that is, researching products) beforehand.